Oliver! marks BANOS Musical Theatre's 90th year as a performing society! 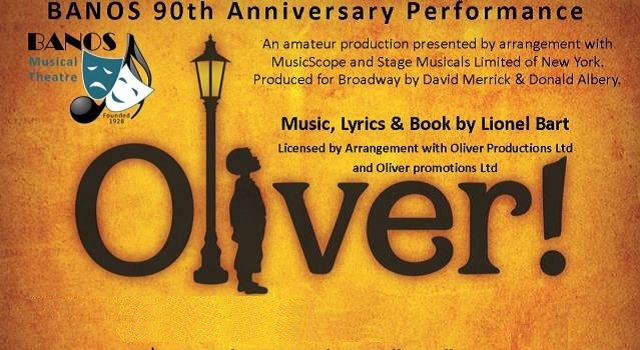 BANOS Musical Theatre (Formerly Banstead & Nork Amateur Operatic Society) are presenting Lionel Bart’s hit musical ‘OLIVER’ AT THE EPSOM PLAYHOUSE, 16-19 May 2017. The show marks the Society’s 90th year as a performing society! The musical is based upon the novel Oliver Twist by Charles Dickens. It premiered in the West End in 1960, enjoying a long run, and its 1968 film adaptation, directed by Carol Reed, won six Academy Awards including Best Picture. Everyone relishes the story of the boy from the workhouse presided over by Mr. Bumble, falling foul of Fagin and his gang and being rescued by Mr. Brownlow. There is the tragic Nancy and the villainous Bill Sykes. Then there are the memorable songs ‘Food Glorious Food’, ‘Where is love’, ‘You’ve Got to Pick a Pocket or Two’, ‘As Long as He Needs Me’ and many more.